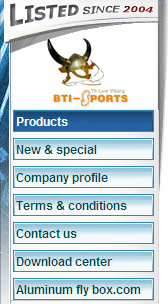 Established in 2001, Bti-Sports?Ltd specializes in producing fishing equipment for fly fishing, general fresh water, carp, and saltwater fishings. Bti-sports manufacture groups cover rods, reels, and hooks, as well as sport bags. We have gained more than 7 best product awards in China fish. We are the No.1. fly fishing tackle supplier in China. Rod and fly rod manufacture are our strengths. 26-year rod building experienced engineer builds Bti-sports rods with prefect action and strength beating any nano rods. Our custom CNC machined fly reel services provide unbeatable competitive position for our customers. We have many supportive programs for different customers including medium and regional importers. Our professional team is didcated to support our customers to build a full outstanding and competitive product range. Profession in production and management, innovation in development and design, your satisfaction is 100% guaranteed.